Quinn McKenzie has always lived what she calls a "beige" life. She has a good job as a high school art teacher, and she's surrounded by family and friends who rely on her. She's dating Bill, coach of the championship high school football and baseball teams and all-around perfect guy. It's a perfectly happy and secure life, and she's bored to the point of insanity. But when Quinn decides to change her life by adopting a stray dog over everyone's objections, everything begins to spiral out of control. Soon a man from her past comes back into her life and the old attraction is ignited again. Now she's coping with dog-napping, breaking and entering, seduction, sabotage, stalking, more secrets than she really wants to know, and two men who are suddenly crazy...for her. 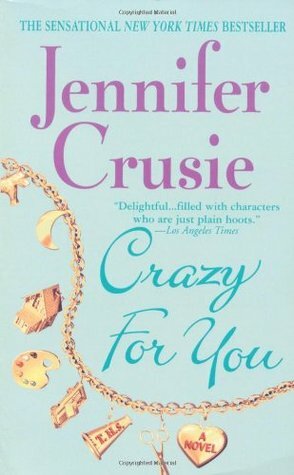 Crazy For You by Jennifer Crusie is a light enjoyable read, with a little darkness thrown in as well. Quinn is a teacher and she is living with Bill, the coach of the baseball and football teams. He is pretty popular and successful. Under him the teams are doing well. However Quinn has decided she wants out of the relationship. Bill has sort of taken over everything and when Quinn is given a stray dog Katie he says no, she can't have it. He even goes about getting rid of Katie. Then there is Nick, she is a good friend with him, and once years ago he was married to her sister, although this has long ago broken up. She is best friends also with Darla - married to Max, Nick's brother. There is attraction between Quinn and Nick but he is commitment phobic and also sees Quinn (or tries to) as that young girl from long ago. Things are beginning to change. Quinn strikes out for herself and sets herself up in a house of her own with Katie. Darla is tired of being taken for granted by Max, she feels all the 'spice' has gone from their relationship. And then things go strange with Quinn's parents. Along with all this Bill is not able to let Quinn go. He is convinced all he has to do is be patient and organise things for her, make plans, and she'll be right back with him. He is so focussed on the loss that his teams begin to flounder. This does not please the Principal of the school, who is a **** anyway. It was good, but she has written better too. Bet Me is her best in my opinion. I think the contemporary romance readers people like myself like her.